The ultimate jewel in any book lover's collection has to be a volume signed by a favorite author; if it's a first edition in the original dust jacket, the value only increases, sometimes exponentially. These special books deserve special care to keep them in top condition and resistant to light, water, pests and humidity. With a little time and money, you can make sure that you get the most enjoyment out of your books, while at the same time protecting them from harm. With care, your most precious books will survive you and go on to be beloved by future generations. Begin taking care of your book the moment you have it signed. After you talk to the author and he signs your book, don't close it right away. Allow it to dry sufficiently so that the ink doesn't bleed onto the preceding page when the book is closed. Protect the removable paper covering on your book -- the dust jacket -- with a thin sheet of Mylar especially made for this purpose. Mylar sheets come in all different styles and sizes and are available through some larger bookstores and all library supply houses. These work to keep dust and dirt from settling and the natural oils on your hands from staining the book's pages and outer covers. These covers also provide a somewhat water-resistant barrier if a few drops of liquid happen to splash on your book cover, though they do not protect against spills or immersion. If your book does not have a dust jacket, you can use Mylar specifically designed to protect the outer cover. Maintain a favorable climate for your books. A temperature of around 60 to 70 degrees Fahrenheit with no more than 30 to 50 percent humidity is generally recommended by archivists and conservationists. Avoid basements and attics unless they are temperature-controlled. High temperatures and humidity can foster the growth of mold. To prevent fading, never place your book in direct sunlight or near a sunny window. Keep interior lighting relatively low, and avoid ultraviolet lights, which have UV levels that can damage paper. Frequently dust your books with a soft, lint-free cloth. Do not use any commercial cleaning product, furniture polish or wax. A feather duster works well for cleaning the top edges of your books as they stand upright on your bookshelf. Purchase glass-fronted bookcases for your most prized books. The glass fronts go a long way toward keeping dust and dirt off your collection, and allow your autographed and other special books to be easily seen and enjoyed without constantly being touched or moved. Within your glass-fronted bookcase, display your prized book front and center by using a small plastic or wooden stand, like those used for displaying collector plates. A double-sided stand will allow you to open the book to the page where it is signed. You may need to place small, felt-covered book weights at the bottom outer corners to gently hold the book open to this position. Store your books straight and upright in a bookcase, never leaning at an angle against another or lying flat. 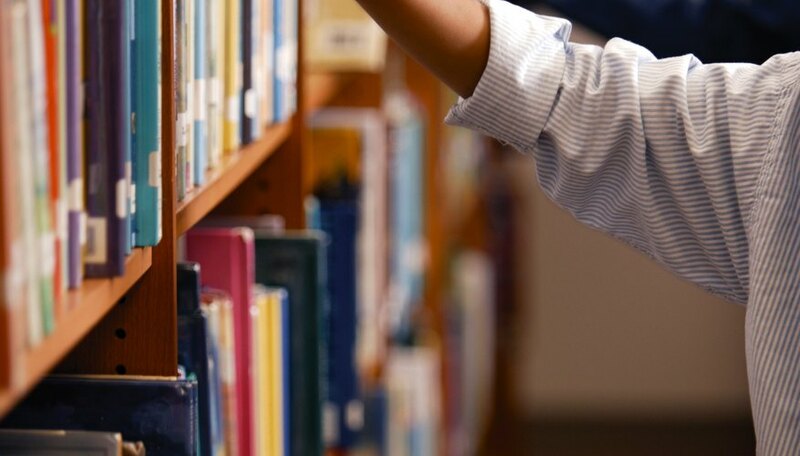 When you remove the book from the shelf, always grasp it between your thumb and forefinger a little bit down from the top spine edge; do not hook your forefinger onto the top edge of the spine and tip it forward to pull it out, as this will cause severe damage to the spine over time. Make or buy a protective "clamshell box,'' a sturdy case with a lid that folds in on itself that is made to your book's precise dimensions so that it fits safely and snugly. These can be as decorative or as plain as you choose and can easily fit right in with your other books on a shelf or displayed on a table. Kathlyn Hyatt Stewart began writing for sociological abstracts in 1985 and had her first article published by "Cambridge Scientific Abstracts," where she was Senior Editor. She has copyedited numerous books and dissertations, proofread for ezines and local papers, and operates Gargoyle Books. Kathlyn has a master's degree in forensic science from National University and bachelor's degrees in English and psychology from University of Virginia.